Rapid growth in population necessitates higher food production. This is motivating farmers to utilize optimum quality fertilizers to procurehigher yields. The key phosphatic fertilizers are diammonium phosphate (DAP), monoammonium phosphate (MAP), and superphosphates. The consumption of DAP and superphosphate fertilizers is comparatively higher among phosphatic fertilizers to the extent of 30% and 38%, respectively. Geographically, the Asia-Pacific region has the highest demand for phosphatic fertilizers, which accounted for a share of 63.09% in 2012. 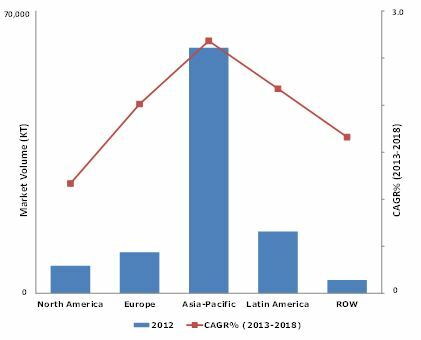 After Asia-Pacific, the Latin American regions have great potential for future growth of the phosphatic fertilizers market. This report provides a comprehensive review of major phosphatic fertilizers consumed across regions. A detailed analysis of the competitive landscape of key market players with their developments, mergers, acquisitions, expansions, and new product developments are furnished in the report. Quantitative data with regards to all the segmentations mentioned above is given in terms of both-revenue and volume. Furthermore, the different key market players within the phosphatic fertilizers market have been profiled in this report. It also includes details such as company overview, financial details, products, strategy, and recent developments. The overall phosphatic fertilizer market is calculated by segmenting the market into micro-markets, based on the share of each application, product, and region. The key players in the market are identified through secondary and primary researches. Based on that, their market shares have been evaluated. This includes a study of the annual reports of top market players and interviews with key opinion leaders such as CEOs, directors, and marketing executives. The overall size of the market is determined by forecasting techniques based on the consumption of phosphatic fertilizers in different applications, regions, and data validated through primary sources. The volume market for phosphatic fertilizers is determined, and the value market is reflected by the average price of the phosphatic fertilizer, which is evaluated using primary and secondary research. The market data is available from 2011 to 2018 with a forecasted CAGR from 2013 to2018. The regions covered include North America (U.S., Canada, and Mexico), Europe (the U.K., Germany, France, Italy, and Spain), Asia-Pacific (China, Japan, and India), Latin America (Brazil and Argentina), and the Rest of the World. The key players covered in this report are Yara International ASA (Norway), Agrium Inc., (Canada), Coromandel International Ltd. (India), Potash Corp. of Saskatchewan (Canada), CF Industries Holdings Inc. (U.S.), Eurochem (Russia), OCP (Morocco), Mosaic (U.S.), ICL (Israel), and Phosagro (Russia).The global phosphatic fertilizers market is expected to grow at a CAGR of 3.2% to be valued at $61,623.5million by 2018. Ground rock phosphate has been used as a source of phosphorous for acid soils in the past. However, due to the low availability of phosphorous in rock phosphate, high transportation costs and small crop responses have reduced the usage of rock phosphate in agriculture. Alternatively, the rising diversified food demand amid rising population factors have challenged farmers to increase the crop output from the limited arable land. These factors have made farmers use chemical fertilizers, which increased the demand for the phosphatic fertilizers market. After nitrogen, phosphorus is an essential macronutrient required for the optimum crop production with respect to fertilizer utilization. Phosphorus nutrient is a component of the complex nucleic acid structure of plants, which regulates protein synthesis. Phosphorus in plants is involved in the formation of sugars, oils, starches, etc., and it also helps with the rapid growth of plants. Various forms of phosphorous are applied to overcome the specific phosphorous nutrient deficiency in soils. The major phosphatic fertilizers used are diammonium phosphate (DAP), monoammonium phosphate (MAP), superphosphates, and others. The global phosphatic fertilizer consumption market is expected to grow at a CAGR of 2.4% by volume and 3.2% by value from 2013 to 2018. The Asia-Pacific region is a larger consumer of phosphatic fertilizers, which is expected to rise at a CAGR of 2.7% by volume and 3.5% by value for the forecasted period. Latin America demonstrates a strong growth potential in phosphatic fertilizer consumption after the Asia-Pacific region. Yara International ASA (Norway), Agrium Inc., (Canada), Coromandel International Ltd. (India), Potash Corp. of Saskatchewan (Canada), CF Industries Holdings Inc. (U.S.), Eurochem(Russia), OCP (Morocco), Mosaic(U.S.), ICL (Israel), and Phosagro (Russia) are key players in the phosphatic fertilizers market and their recent development strategies have been studied. 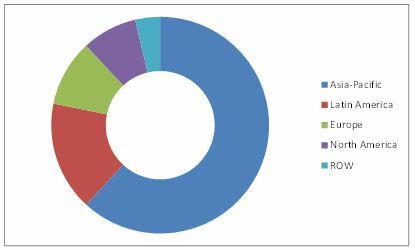 In 2012, the grain & oil seeds segment held a greater share of the phosphatic fertilizers market of 52.2% by volume, in terms of application. Asia-Pacific holds a major market share of nearly 58.3%, by volume in the grain & oil seeds segment. 9.1 Potash Corp. of Saskatchewan Inc.
9.6 CF Industries Holdings Inc.